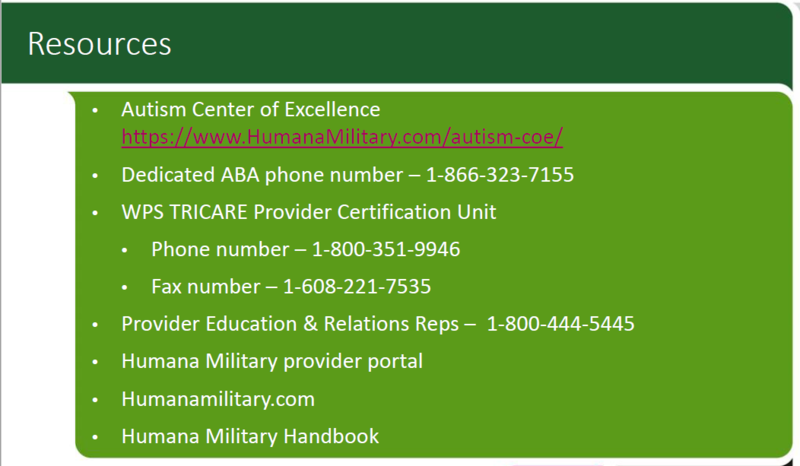 Humana held a Webinar on 2/8/18 to discuss the changes from HNFS to Humana for Tricare. Click here for the slides. Certification is separate from credentialing. Go to the Humana Web Site for forms and information. Providers will be certified then credentialed. Anyone delivering services (BCBA, BCaBA, RBT) must be certified. Only BCBAs are credentialed at this time. BCaBAs and RBTs are listed under the BCBA using a roster. Providers are re-credentialed every three years. It is not required that RBTs have an NPI at this time (might be required in the future). See the Web site for authorization information and submit an authorization. A PDD-BI (both parent AND teacher for re-auth and parent only for initial) must be done every 6 months. Vineland 3’s and SRS-2 are completed every 2 years. The code to bill (one unit only!) is T1023 (on par with 96102). Some authorizations say 99 units which means 99+ units. HNFS authorizations will be honored until they expire. Some CPT Codes are listed as no-pay by the government, but they are authorized for autism demonstration only, so they will be paid. Claims must be filed within one year from date of service or they will not be paid. See presentation above for code descriptions and payment amounts. For Re-authorization, you can use the form provided or your own form as long as all of the information is included.